The fan works inside the oven to circulate and distribute heat efficiently, this both heats up the oven quickly, cooks food in a shorter amount of time and eliminates cold or hot spots in your oven. The grill covers the whole of the top of the oven cavity, this is to make the best use of the shelf space available and heat as wide an area as possible. The half grill option allows you to focus grilling on a smaller, more centralised area and not have to heat the whole element if you don’t need to. When you open the oven door, you can lose up to around 20% of the internal heat in the oven. Take this into consideration and try not to open the door during cooking as this will increase the cooking time because the oven has to work harder to heat up again. A good tip is to set the temperature a little higher to preheat the oven and then, when you put in the food, turn the temperature control down to where you want it. This way, you have allowed for a little heat loss. Do you know what all the cooking functions on your oven are for? Are you one of the millions that cooks everything on the same setting? Does what it says and illuminates the oven cavity. We have halogen lights across the range for better light inside the oven, allowing you to see how food is cooking without the need to open the door. This functions uses just the fan, circulating air around the oven cavity. This in turn speeds up the natural defrosting process, allowing you to defrost approximately 1kg per hour. This is a traditional cooking setting that uses the top and bottom heating elements only. 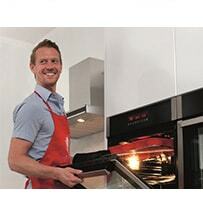 Natural convection creates a perfect cooking zone in the centre of the oven. We think that this setting produces the best baking results for cakes and pastries. Moving on from heating the cavity with just the top and bottom elements, this setting also circulates the hot air with a fan. 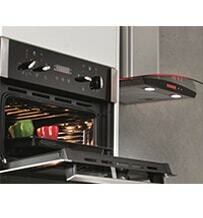 This distributes the heat evenly, allowing you to use multiple shelves simultaneously. Use this setting for your family meals, roast dinners and large bakes. This is definitely the most used oven setting. The heat comes from the element around the fan itself, quickly heating up the cavity and circulating hot air around the oven. Preheating times are cut right down, letting you get dinner on as fast as possible. Food is quickly sealed so multiple dishes can be cooked at the same time, without the flavours being transferred. Perfect for your weekday meals or food in a hurry, try this setting with fish and chips, chops with a side dish of vegetables or pizza and wedges. As well as preheating quickly, this setting has the added benefit of using heat from the bottom element. This makes it perfect for crisp pizza bases that don’t take too long to get to the table. This is similar to the previous function, but uses the top element as well as the fan instead of the lower one. You get the same quick heat from your oven and the top element heat makes it perfect for reheating meals or keeping dishes warm. Don’t mistake this for the fan-cooking with lower heat setting. The heat here comes from the bottom element alone, with a fan to simply circulate the air. If you want perfect casseroles or delicious biryani, this is the oven function to use. 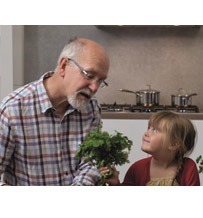 Use this setting to finish off cauliflower cheese, lasagne or moussaka. The top element heat finishes of dishes that need extra crisping or browning perfectly. Warming oven Plates, naans, proving dough, or blind baking pastry cakes, this function naturally and delicately allows you to warm through dishes that don’t need a thorough roasting! This eco-clean function is featured on the SK451. The oven can be heated to around 200°C to loosen grease and cooking residue, which is them absorbed by the catalytic liners. 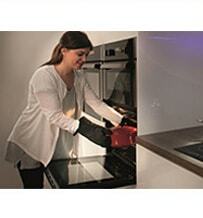 By changing these liners when saturated, you will avoid the need to ever pick up a harsh oven cleaner again. Don’t waste energy using the whole grill for just a couple of rashers of bacon. The half grill setting is there for when you need accurate grilling or when you have not filled the whole grill pan. Use the full grill setting to prepare perfectly grilled food for the whole family. Wow, that’s hot! If you are melting sugar on a crème brulee, for example, and want a glassy ‘crack’ when you dip in your spoon-you need a turbo grill. It reaches a higher temperature than a standard grill would alone and allows you to chargrill steaks or blacken pepper skins like a professional chef. Just the same as our full and half grill functions but with the added benefit of a fan to circulate warm air around the oven cavity. This helps food to cook through, as well as browning the surface. This works great on salmon steaks or aubergines topped with feta. 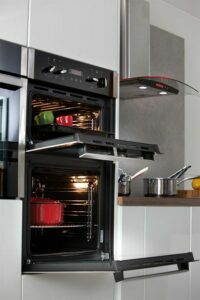 If you have chosen an oven or range cooker with our rotisserie, you will really be able to impress friends and family. Create the drool-worthy rotisserie chicken, with crisp skin and juicy texture, right at home in your kitchen. The food is slowly turned on an automatic ‘spit’, with heat radiating down from the top of the oven for even browning. With the addition of a fan to circulate the hot air, rotisserie cooking time is significantly reduced, giving you perfect results in far less time. This works just like the rotisserie electric setting, but with heat coming from both the top and bottom elements. If you are going for something large, or more adventurous-think pork, beef or even venison, then this will ensure even cooking for a bigger joint of meat. We know that steam cooking uses zero fat and locks nutrients into the food, but did you know that it tastes fantastic too? Using a 1L water reservoir, the steam oven injects steam into the oven cavity which surrounds food, cooking it thoroughly and quickly. Steam veg is brilliant, bright in colour and tasty when cooked ‘al dente’. However, we promise you that when you have tasted a steam-roasted chicken, you will always want it cooked this way-yes, the skin does go crispy! 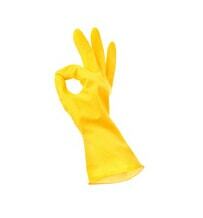 Get rid of those marigolds and throw out the harsh oven cleaning chemicals. Use the pyrolytic cleaning setting for effective incineration of grease, cooking residue and all of those ‘burnt on bits’. The cavity is heated to over 400°C, reducing dirt to a fine ash that can simply be wiped away after the programme ends. Our pyrolytic ovens come complete with a safety lock, to avoid the oven door being opening at such high temperatures, as well as turbo and eco settings for quicker or more thorough cleaning. Tip: remember to remove your oven shelves before using this setting, the chrome will corrode if you leave it inside during a pyrolytic clean. Probably the most traditional of all the cooking functions. A gas oven works by heat rising from a burner at the base of the oven. 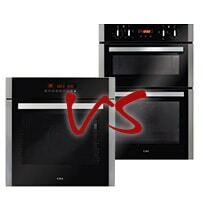 The result is an oven temperature that varies from hottest at the bottom to slightly less hot at the top. Many customers swear by this cooking style and it has the added benefit of allowing you to cook at different temperatures simultaneously; ever bought separate dishes that require varying cooking temperatures from 180°C to 200°C-this is definitely the solution. Unlike the new electric grills on the market, the gas grill requires you to leave the door slightly ajar. The heat is emitted from the grill and give perfect results for sausages, burgers and halloumi. Rotisserie gas-This works just like our other rotisseries, with the option of using either the grill or the gas burner to provide even browning on meat joints and chicken. 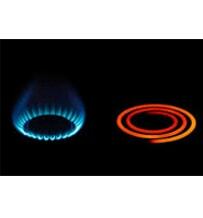 This function uses the gas burner at the base of the oven to heat the oven cavity. An additional fan circulates the hot air around the cavity, evening up the cooking temperature for cooking results more like an electric oven.